Most connoisseurs of Italian cooking will tell you there are four attributes that determine the quality of a pasta: the type of wheat used, the quality of the water, how the pasta is drawn, and how the pasta is dried. Of course, the way pasta is cooked is also important but this fifth attribute is the responsibility of the cook whereas the former four attributes are determined by the pasta maker. Opinions vary on wheat because of flavor preferences although organically grown durum or semolina are often favored for pasta because the dough is firmer and therefore easier to shape. Generally speaking, filtered water or water without chlorine are preferred when making any kind of pasta (or bread) – just ask your local bagel maker or pizzeria crust chef about water and chances are you’ll get an earful. The drawing of pasta refers to how the pasta dough is shaped and cut. 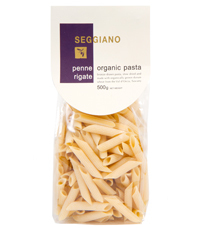 Most modern pasta manufacturers use a teflon covered die to shape and cut the pasta which creates a smooth pasta. A bronze covered die produces pasta that is a light shade of yellow with a rougher surface that better holds sauce and seasoning. The only negative to this type of pasta is that it can absorb water quicker in the cooking process and therefore overcook easily. So, if you are unfamiliar with cooking “bronze drawn” pasta, periodically check the pasta to avoid overcooking. 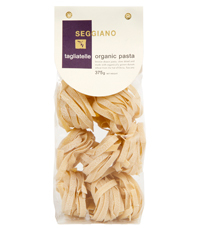 The objective of drying pasta is to remove moisture and specifically water although the process is also about consistency throughout the pasta. Pasta more readily dries from the outside in so the drying process must balance temperature, ventilation, and time to ensure an evenly dried pasta. 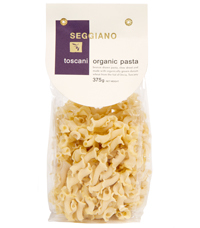 In trying to find pasta made with consideration to the above four attributes, look no further than Seggiano Organic Pasta. 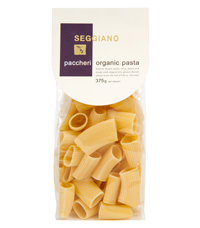 These Italian made pastas are bronze drawn made with organically grown durum wheat from the Val d’ Orcia in Tuscany and water. 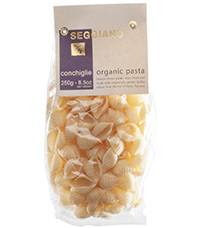 Because heat degrades protein (the “parte nobile” of wheat which gives the cooked pasta flavor and consistency), Seggiano Organic Pasta is slow dried for a minimum of 26 hours at a low temperature. 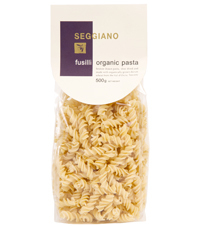 Collectively these attributes – the premium organic wheat, the water, the drawing process, and the slow, low temperature drying period – make for pasta with an even consistency, an excellent flavor, and a superb way to hold the sauce and seasoning. Each 2 ounce serving has 200 calories and provides 6 grams of protein, 3 grams of sugar, 2 grams of dietary fiber and less than a gram of fat and virtually no sodium (less than 10 mg). 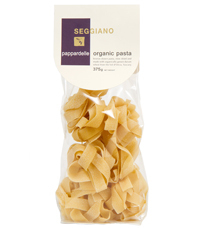 The pasta packets are available at specialty grocery stores nationwide including some Whole Foods Markets for $6-$7. 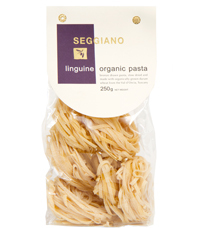 To read more about Seggiano Organic Pasta go to the official company website: www.seggiano.com. 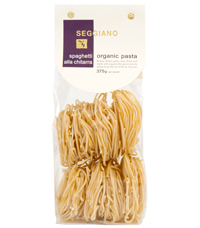 My Whole Foods no longer carries Seggiano brand; I want to order about 10 bags of PICI. How can I do this? Hi Pat: Unfortunately, I don’t know of any on-line retailer that sells Seggiano pasta but I have purchased the pasta and sauces at more than a dozen Whole Foods. Speak to customer service at your local Whole Foods, check other locations, and consider writing something on Seggiano’s Facebook page (or even your local Whole Foods Facebook page).